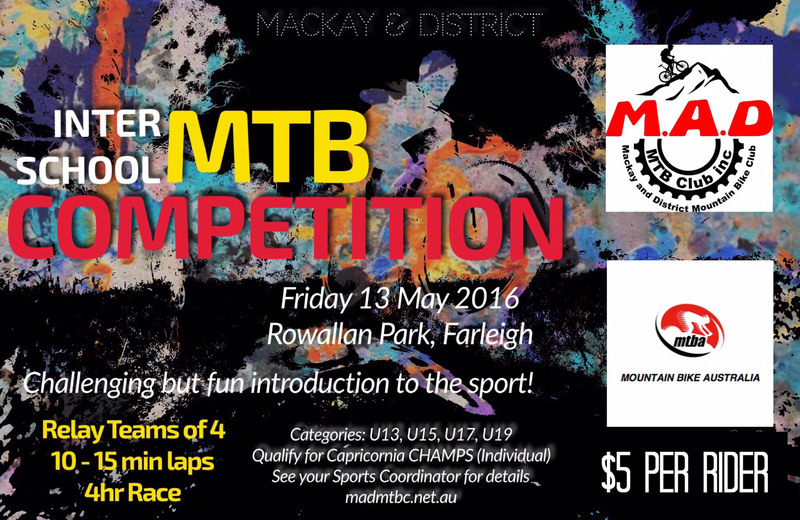 The Mackay & District Mountain Bike Club is pleased to announce a challenging, but fun, introduction to the sport for school aged children who do not currently participate in MTB events outside the school environment. All who can ride a bike are welcome. The day will be coordinated by Mr Peter Lister, MTBA Level 0 & 1 MTB Coach; National MTB XCO and XCC Series Winner (Masters ¾) in 2015; and Head of Faculty HPE Mackay Christian College. • Total ride time for the event for each student approximately 1 hour (eg. Teams of 4 for a 4 hour event). Each participant will receive a participation certificate and medal/perpetual trophy for the winning teams. Location: Mackay & District Mountain Bike Club, Rowallan Park, Farleigh. • First Aid: Convenor to provide first aid kit only. Students participating in this District competition will be eligible to attend the following.